In an urban picture of globalization, movement of people and economic and technological changes, cities have to think smart to keep up. Luxembourg is really smart for its size, and the city of Aalborg, Denmark gives Nordic light a new meaning. 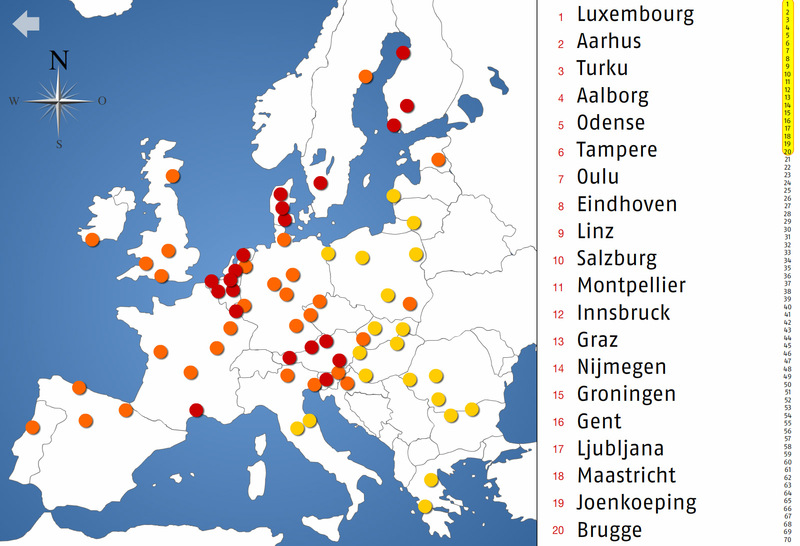 A team from universities in Vienna, Delft and Ljubljana compared the competitiveness and sustainable development of 70 medium sized European cities. Medium because their big brothers and sisters already receive a lot of attention, yet the smaller ones face corresponding issues, often with fewer resources. Although when you’re smaller, you’re often more flexible, which can prove to be an advantage in competition with bigger siblings. About 120 million people live in medium sized European cities. The chosen cities fit into a size medium because they have a population of between 100 000 and 500 000, in a commuter belt of less than 1, 5 million people, meaning no big brother nearby, and with at least one university to assure a knowledge basis. The team chose quite a holistic approach, focusing on economy, people, governance, mobility, environment and living. Luxembourg City tops the ranking, followed by six cities in Denmark and Finland. Austria and Holland score quite high as well, whereas you have to scroll down for UK cities. La Grande Région is also represented by Nancy (26) and Trier (27). Luxembourg scores especially high on smart economy and smart people. The economic image is strong, a main criterion being decision-making, but then Luxembourg is also one of very few capital cities on the list. It is a productive city in terms of GDP per employee, and not surprisingly, the economy has a strong international embedment. People are socially and ethnically mixed, participate in public life, and are cosmopolitan and open-minded, the latter measured largely by immigration-friendliness, knowledge about the EU and voting in European elections. However, Luxembourg City takes a fall when it comes to environment – down to 25. Pollution, environmental protection and sustainable resource management, or more simply put use of water and electricity, leave more to be desired. This is precisely the Smart Cities’ purpose; to identify strengths, weaknesses and focus areas in order for each city to position itself. Montpellier is the environmental winner, followed by Maribor and Ljubljana, Slovenia. Holland has the “mobility” top 3, and Austria / Belgium the “living” top 5. How about the big brothers? The smartest ones are Copenhagen, Stockholm and Amsterdam. A recent example from Amsterdam is making housing along its famous Canal Ring energy neutral, and thereby serving as role models for the rest of the city. Let’s take a look at another example, from number 4 on the list: Aalborg in Denmark. Aalborg, main square, late 2012: Teenage girls pretend they’re on the catwalk, adults are zigzagging between lamp posts, playing like kids, dancing, prancing. And the lights are turned on and off to the beat of their movements. These living lights are a result of researchers at the Aalborg University testing out functional, yet beautiful energy-saving street lights. Previous research shows that by adapting the use of electricity to the use of the place, the city can save close to 90 % on electricity. At the same time, sociologists look at how people respond to the light, and how it affects interaction, behaviour and the perception of others. When people dance in the streets, they become actors, the city becomes their stage, and people see each other differently. The research team also tested out other creative ways to use light technology, for example in adapting city lights to the wind. They think that visualizing the wind through light might bring people together and make them aware of the wind as part of our environment. Their vision is beautiful, efficient and intelligent city lights, providing information on how people use their city. As the team behind the smart cities ranking puts it: “Self-decisive, independent and aware citizens are crucial”. Citizens of Luxembourg City seem to do well, but since there’s always room for improvement, we could use cultural facilities more often, think green, especially in terms of mobility, and be more creative.